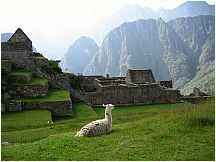 50 Free photos of Machu Picchu, Peru. 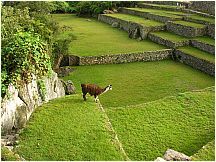 Machu Picchu (In Quechua language means Old Peak; sometimes called the "Lost City") is a pre-Columbian city created by the Inca. 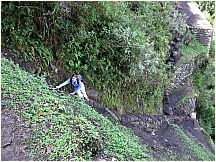 It is located at 2,430 m (7,970 ft) on a mountain ridge above the Urubamba Valley in Peru, about 70 km (44 mi) northwest of Cusco. 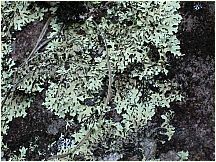 Forgotten for centuries by the outside world, although not by locals, it was brought back to international attention by archaeologist Hiram Bingham who rediscovered it in 1911, and wrote a best-selling work about it. 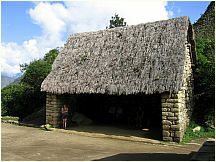 Peru is pursuing legal efforts to retrieve thousands of artifacts that Bingham removed from the site. 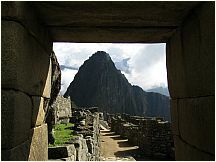 Machu Picchu is probably the most familiar symbol of the Inca Empire. 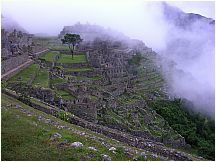 Often referred to as "The Lost City of the Incas", since 1983 the site has been designated as a UNESCO World Heritage Site. Machu Picchu was constructed around 1450, at the height of the Inca empire, and was abandoned less than 100 years later, as the empire collapsed under Spanish conquest. 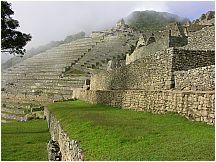 Although the citadel is located only about 50 miles from Cusco, the Inca capital, it was never found and destroyed by the Spanish, as were many other Inca sites. Over the centuries, the surrounding jungle grew to enshroud the site, and few knew of its existence. 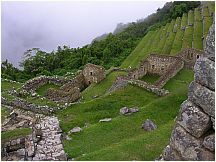 It wasn’t until 1911 that Yale historian and explorer Hiram Bingham brought the “lost” city to the world’s attention. 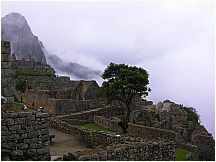 Bingham and others hypothesized that the citadel was the traditional birthplace of the Inca people or the spiritual center of the “virgins of the sun,” while curators of a recent exhibit have speculated that Machu Picchu was a royal retreat. 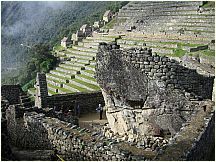 Regardless, the presence of numerous temples and ritual structures proves that Machu Picchu held spiritual significance for the Inca. 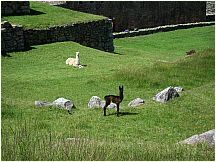 See the llamas of the Machu Pichu Central Plaza interact in the movie. 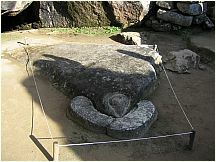 It is thought that the site was chosen for its unique location and geological features. 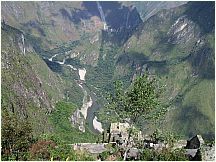 It is said that the silhouette of the mountain range behind Machu Picchu represents the face of the Inca looking upward towards the sky, with the largest peak, Huayna Picchu (meaning Young Peak), representing his pierced nose. 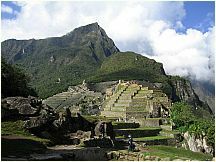 In 1913, the site received significant publicity after the National Geographic Society devoted their entire April issue to Machu Picchu. 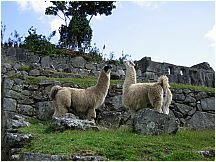 Llamas can be found roaming over all of Machu Picchu. 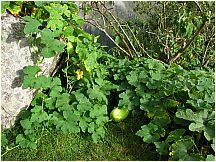 They crop the grass continuously and in many places humans and other animals cannot reach. View of Huayna Picchu from Machu Picchu looking through a trapezoidal doorway, typical of the design prowess of the Incas. 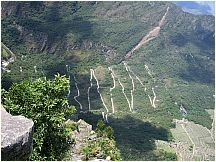 Machu Picchu seen from Huayna Picchu, showing the Hiram Bingham Highway used by buses taking tourists to and from the town of Aguas Calientes. 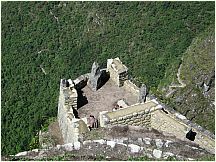 Old building on Huayna Picchu. Clearly a large population lived at the top despite nearly impossible access. 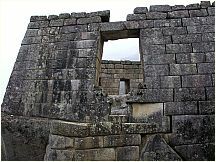 View of standard stone architecture where "temple quality" does not need to be met. These two llamas at Machu Picchu were having a loud vocal disagreement. 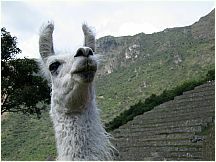 This Llama at Machu Picchu was very interested in the disagreement of the two llamas in the preceding photo. 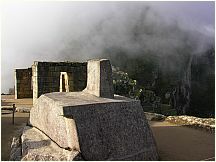 One of many water fountains at Machu Picchu. 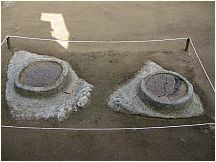 They are interconnected by channels and water-drainages perforated in the rock, designed for the original irrigation system. 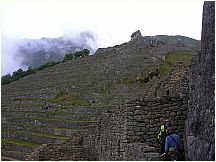 Looking across the front terraces of Machu Picchu towards the washout that made the Inca Trail impassable for several months. Hotel at Machu Picchu with bus station and bus. 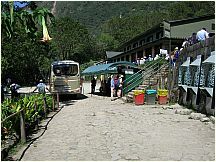 Every few minutes, buses traverse the Hiram Bingham Highway taking tourists to and from the town of Aguas Calientes. 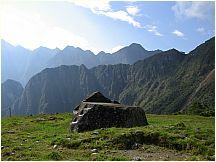 In 1981 an area of 325.92 square kilometres surrounding Machu Picchu was declared a "Historical Sanctuary" of Peru. 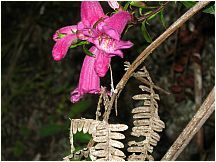 This area, which is not only limited to the ruins themselves, also includes the regional landscape with its flora and fauna, highlighting the abundance of orchids. 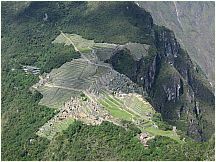 One theory maintains that Machu Picchu was an Incan "llacta": a settlement built up to control the economy of the conquered regions and that it may have been built with the purpose of protecting the most select of the Incan aristocracy in the event of an attack. 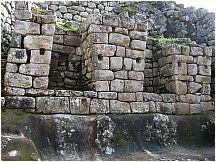 Based on research conducted by scholars such as John Rowe and Richard Burger, most archaeologists now believe that, rather than a defensive retreat, Machu Picchu was an estate of the Inca emperor Pachacuti. Johan Reinhard presents evidence that the site was selected based on its position relative to sacred landscape features, especially mountains that are in alignment with key astronomical events. 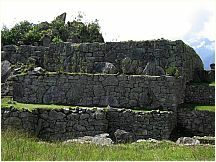 All of the construction in Machu Picchu uses the classic Inca architectural style of polished dry-stone walls of regular shape. 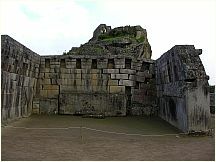 The Incas were masters of this technique, called ashlar, in which blocks of stone are cut to fit together tightly without mortar. Many junctions are so perfect that not even a knife fits between the stones. The Incas never used the wheel in any practical manner. 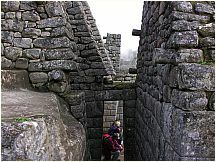 How they moved and placed enormous blocks of stones is a mystery, although the general belief is that they used hundreds of men to push the stones up inclined planes. 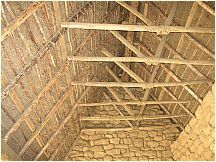 It is unknown if the Incas left behind any documentation about that process because the writing they employed, called khipus, has not been translated. 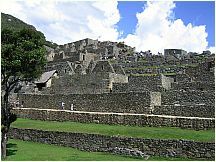 The space is composed of 140 constructions including temples, sanctuaries, parks and residences, houses with thatched roofs. There are more than one hundred flights of stone steps – often completely carved in a single block of granite – and a great number of water fountains, interconnected by channels and water-drainages perforated in the rock, designed for the original irrigation system. 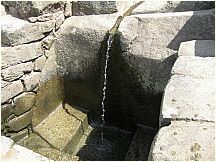 Evidence has been found to suggest that the irrigation system was used to carry water from a holy spring, to each of the houses in turn, the order being dictated by the perceived holiness of the inhabitants. 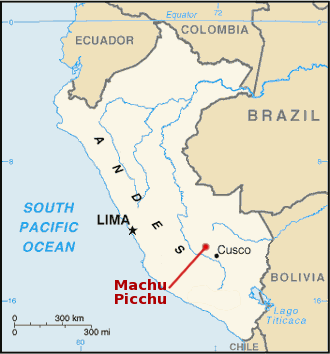 Machu Picchu (del quechua machu, viejo, y picchu cima, es decir, "cima vieja") es el nombre contemporáneo de la antigua llacta (poblado) inca de piedra (cuyo nombre original habría sido Picchu o Picho). 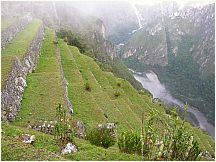 Construido principalmente a mediados del siglo XV en el promontorio rocoso que une las montañas Machu Picchu y Huayna Picchu en la vertiente oriental de los Andes Centrales, al sur del Perú. 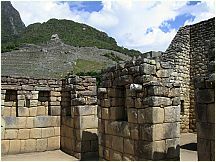 Documentos de mediados del siglo XVI sugieren que Machu Picchu habría funcionado como una de las residencias de Pachacútec o Inca Yupanqui (primer emperador inca, 1438-1470). Sin embargo, algunas de sus mejores construcciones y el evidente carácter ceremonial de la principal vía de acceso a la llacta demostrarían que ésta fue usada como santuario religioso. Ambos usos (palacio y santuario) no habrían sido incompatibles. Se ha descartado, en cambio, un supuesto carácter militar (por lo que los populares calificativos de "fortaleza" o "ciudadela" han sido superados). 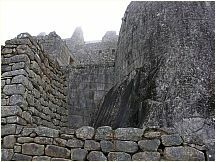 Machu Picchu es considerada al mismo tiempo una obra maestra de la arquitectura y la ingeniería. Sus peculiares características arquitectónicas y paisajísticas y el velo de misterio que ha tejido a su alrededor buena parte de la literatura publicada sobre el sitio, lo han convertido uno de los destinos turísticos más populares del planeta. 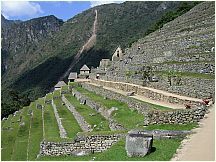 Machu Picchu está en la Lista del Patrimonio de la humanidad de la UNESCO desde 1983. Es una de las nuevas siete maravillas del mundo desde el 07-07-2007.